In a recent article for the Laurel Historical Society, I noted the possibly coincidental links between local roofed graves, the family of John C. West (1814-1858), and a site in northeastern Wicomico County known as Quaacosan Ridge. This is one of several sites on the Delmarva Peninsula named after Native American mortuary houses and used as landmarks by surveyors from the 17th century into the 19th. “Quiacason” — as I will spell the term throughout this post — is one of those Native American terms that the English colonists struggled to spell, resulting in creative spellings including quacasun, chiocason, quiocosin, quiocosine, quoioccason, quioccasin, quioccosin, quiakeson, quiankeson, quankosine, and even cuiackason or cuiaskason. It refers to a wooden mortuary or charnel house, described by some sources as crib-like, in which bodies of the deceased were placed. This custom was encountered in the mid-Atlantic and parts of the South, with some variations; for example, it seems that some quiacason houses served as permanent resting places, while others were intended to be temporary protective enclosures while a corpse decomposed, after which the bones were removed and buried in an ossuary. The best-known account of a quiacason house on the Delmarva Peninsula is one of the latest. In a letter to Thomas Jefferson dated September 18, 1797, Cambridge resident Dr. William Vans Murray reported that a remnant of Choptank Indians (who he called Nanticokes) living at Locust Neck in Dorchester County, Maryland, preserved the remains of a chief named Wynicaco in a “Quacasun-house” or “chio-ca-son house.” Wynicaco died circa 1715, and is mentioned in many records of the period. “Indian Charnal House” by John White, 1580s. But references to local quiacason houses date back to the 17th century. Possibly the earliest is found in the description of a 500-acre tract named Quiakeson Neck or Quiankeson Neck, which was surveyed for James Weatherly in 1668 and described as lying on the “south side of Nanticoke River, beginning at a marked pine by a swamp near Indian Quiankeson houses.” (Marye, 1936). Other records place this site near Barren Creek in what is now western Wicomico County. In May of 1686, the “King of Assateague,” whose people were living at “Askiminokonson” at the time, complained to the Maryland authorities “against Edward Hamond for that whereas it is a custom among them upon the death of an Indian king to save his bones and make a case with skinns wherein they inclose the bones and fill it up with Ronoke, and other their riches, he the said Hamond about a month since had upon the like occasion of one of their kings dyeing stolen away the skinns and roanoke from the place where he was layd…” Although the English took the complaint seriously enough to investigate, they eventually dismissed it. A similar incident occurred in Nanticoke territory in 1707, when Samuel Marke, Isaac Mallett, and Joseph Tompson robbed a “Quiacosan house.” Although their guilt seems to have been taken for granted, six years later, Nanticoke leaders “Tom Coursey, Pantikas, and Rassekettham” complained that “they had not the satisfaction proposed for the robbery done by the Malletts on their Quankosine house…” It’s unclear where this happened. At the time, most of the Nanticokes were living in settlements along Chicacoan Creek and Broad Creek; “Pantikas” is surely an alternate spelling of Panquash, whose leadership among the Nanticokes spanned several decades, while “Rassekettham” would seem to be the same leader for which Rossakatum Branch, which flows through Laurel, was named. It’s unclear whether the issue was ever resolved. Another tract named Quiakeson Neck, this one of 50 acres, was surveyed for Henry Dorman in 1734, and described as being “near the heads of the branches of Wiccomoco River bounded as follows Begining at a marked white oak standing on the North side of the Main Branch of the said Neck about sixty yards from the side of the afsd Branch & near the fork of the afsd neck where a Quiakeson house formerly stood…” The exact location of this tract is unclear, but in today’s terms it is probably located northeast of Salisbury. A brief reference comes from a land commission held in Dorchester County in 1761, which noted that one of the original Choptank reservation’s bounders had been a tree standing in Cuiackason Swamp. Yet another Wicomico reference — again, from old Worcester records — is found in the name and description of a 39-acre tract named Quaacosan Ridge, which was surveyed for Isaac Mitchell in 1758. 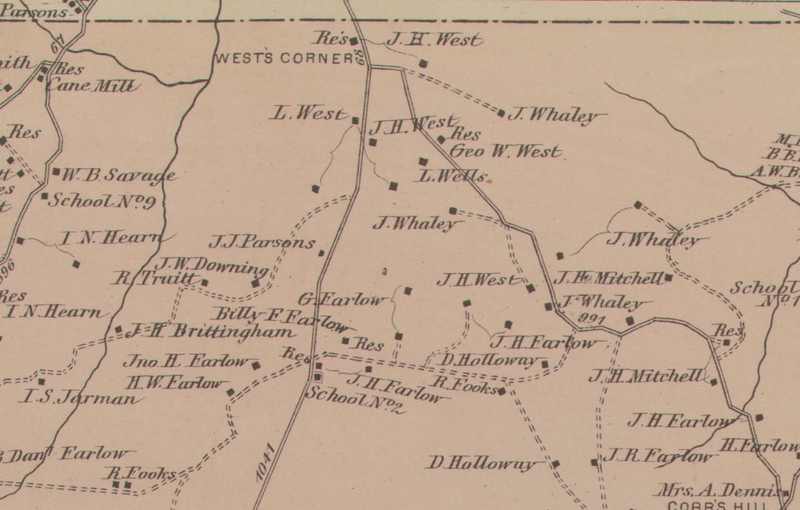 This tract was fairly close to the Transpeninsular Line, or today’s state line, in or near the Pocomoke Swamp. The name seems to have survived in some form, for when the 14th election district was created in 1906, the “Quackinson School House” was used as a landmark. The probable neighborhood of Quaacosan Ridge, from the 1877 Lake, Griffing, and Stevenson Atlas. We shouldn’t necessarily assume that the local quiacason houses looked like the one John White painted in North Carolina. Even without a visual, we can make some educated guesses about their design based on their purpose and the materials available. Since a house had to protect decomposing corpses from scavengers — including black bears — for an extended period of time, it had to be strong. These were not flimsy structures. One can imagine a sort of elevated wigwam built with sturdy posts and enclosed with bark. Such a structure could withstand hurricanes if built well. It is apparent, despite the various spellings, that the English colonists (surveyors in particular) were familiar with quiacason houses and knew the Indian word for them. In an era when most landmarks consisted of natural features such as creeks and trees, and the occasional village or plantation, quiacason house sites were noteworthy. Between the stench of the rotting dead and European superstitions concerning graveyards, the colonists probably tried to avoid the sites (assuming they weren’t robbing them), but were certainly aware of their locations. Eventually, however, the demand for arable land prevailed. “Ridges” — in reality, points of high elevation compared to surrounding swamps — became ideal sites for homes and farm buildings. It is unclear whether quiacason house sites doubled as ossuary burial sites. Since relatively few of each have been documented, it’s not surprising that they don’t seem to overlap. Personally, I think that a dry, secluded ridge would have been a practical site for the burial of bones following their cleaning. From an archaeological point of view, it would probably be easier to locate quiacason house sites and search for evidence of ossuaries, than to search known ossuary sits for evidence of wooden posts — though either approach could work.